Let everyone who visits know you are not a quitter when display this beautiful Personalized Hope and Love Breast Cancer Doormat. 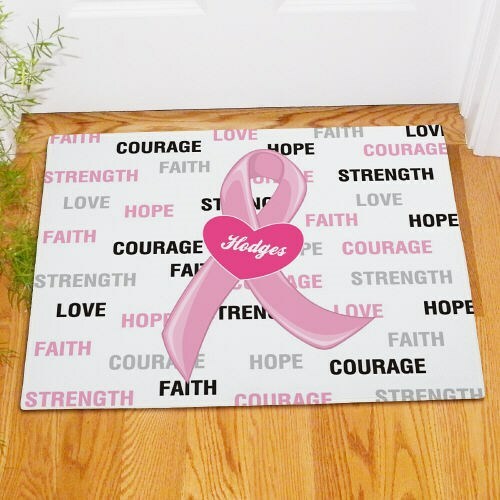 Our lovely doormat shows your Courage, Love, Faith, Strength and reminds everyone to be aware of breast cancer. This Personalized Breast Cancer Awareness Doormat is not just for Breast Cancer Awareness Month, but it’s perfect for all year round. Today’s Price: $22.99 In Stock! Additional Info At MyWalkGear.com we know how important it is to be aware. That is why we have created a large collection of Personalized Breast Cancer Shirts and Walk Gear that is perfect for any walk event you may be joining. We have some great Breast Cancer Walk Apparel that can be personalized with any message to show who you are supporting and wonderful Personalized Breast Cancer Keepsakes for you to show awareness each day. Be sure to also take a look at our Personalized Hope and Love Breast Cancer Hat and our Personalized Hope and Love Breast Cancer Water Bottle for all of your upcoming walk events.